In this article I will show more than 100 different ways to remarket to your target audience. You will learn about more than 100 different customers personas and how they can be used to get optimum results from your marketing campaings, budget and testing efforts. #1 About different types of ecommerce abandonments. #3 What are low value remarketing audiences. #4 Four different methods for creating remarketing audiences in Google Analytics. 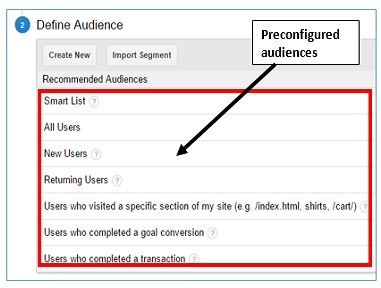 #6 How to use enhanced ecommerce segments for remarketing in Google Analytics. This article will change the way you think about your target audience for good. That’s a promise. In the context of ecommerce, Remarketing audience is a list of users who started any shopping activity on your website. Any or all of these shopping activities can be abandoned by users before they bounce from your website. #2 Basket abandonment – adding products to the shopping cart but not starting the checkout process. #3 Shopping abandonment – starting a shopping activity but not adding any product to the shopping cart. Users who abandoned the checkout have highest propensity of making a purchase in subsequent sessions (if correctly retargeted) because they showed lot of interest in making a purchase. Alternatively, users who abandoned the shopping have a low propensity of making a purchase in subsequent sessions because they didn’t show any considerable interest in making a purchase. In retail language, these are the people who were “just looking around”. Consequently, users who abandoned the checkout are more important retargeting audience than the users who abandoned the basket or shopping. Customers who have made two or more transactions on the website are repeat customers. Repeat customers who frequently spend more than the average order value of your website or who frequently buy high priced products are high value repeat customers. These are the most profitable customers for your business and you should always identify them, cherish them and re-target them with irresistible offers. Repeat customers who frequently spend less than the average order value of your website or who frequently buy low priced products are low value repeat customers. These customers are less profitable than their corresponding high value counterparts but they are still important remarketing audience. Repeat customers who do not show any pattern while making a purchase are your average repeat customers. These customers can buy any product regardless of their price. Any repeat customer who can’t be put into high value or low value bracket is your average repeat customer. Customers who have made only one transaction on the website so far are new customers. Prospect are those users who started any shopping activity on your website but didn’t make a purchase. So when it comes to retargeting, “who” has abandoned the shopping activity is as important as the type of abandonment. So repeat customers who abandoned the checkout process are more important for retargeting than new customers who abandoned the checkout process (while trying to make a second purchase on your website). Similarly, among repeat customers, high value repeat customers are more important for retargeting than low value or average repeat customers. And it is not just about who is more important or less important for retargeting. It is more about the type of messaging and offer you need to use for retargeting. You can’t remarket to all users in the same way, though many marketers do that. The ad copy and offer for retargeting repeat customers would be different than the ad copy and offer for retargeting new customers or prospects. Similarly, the ad copy and offer for retargeting high value repeat customers would be different than the ad copy and offer for retargeting low value or average repeat customers. Not all remarketing audiences are equally valuable for your business bottomline. Some audiences are more valuable than others. So you can’t have one size fit all remarketing campaigns. For example if you sell pet food, you don’t want to retarget cat owners with Dog food ads and Dog owners with cat food ads. Similarly you don’t want to retarget people with printers’ ads when they showed interest in buying books from your website. Therefore such type of segmentation of remarketing audiences is critical esp. if you manage a large online store with tens of thousands of products and hundreds of product categories and you need to prioritize your re-marketing efforts in order to get optimum results from your remarketing campaigns, marketing budget and testing. #1 High value repeat customers who abandoned the checkout of a particular product. #2 High value repeat customers who abandoned the checkout of a particular product category. #3 High value repeat customers who started the checkout process but abandon it. #4 High value repeat customers who clicked on an internal / external promotion campaign but didn’t make a purchase. These customers are the people who clicked on one of your text or display ads (hosted on your website or some other website) but didn’t make a purchase. #5 High value repeat customers who abandoned the checkout because of some website error during the checkout. #6 High value repeat customers who searched for a product on the website but didn’t make a purchase. #7 High value repeat customers who watched a product video on the website but didn’t make a purchase. #1 High value repeat customers who added a particular product to the shopping cart but didn’t start the checkout process. #2 High value repeat customers who added any product of a particular product category to the shopping cart but didn’t start the checkout process. #3 High value repeat customers who added a product to the shopping cart but didn’t start the checkout process. #4 High value repeat customers who clicked on an internal / external promotion campaign but didn’t start the checkout process. #5 High value repeat customers who searched for a product on the website but didn’t start the checkout process. #6 High value repeat customers who watched a product video on the website but didn’t start the checkout process. #1 High value repeat customers who viewed a particular product but didn’t add it to the shopping cart. #2 High value repeat customers who viewed any product of a particular product category but didn’t add it to the shopping cart. #3 High value repeat customers who viewed a product but didn’t add it to the shopping cart. #4 High value repeat customers who viewed a particular product category page but didn’t click on any product link. #5 High value repeat customers who viewed a product category page but didn’t click on any product link. #6 High value repeat customers who viewed an internal / external promotion campaign but didn’t click on it. #7 High value repeat customers who searched for a product on the website but didn’t add any product to the shopping cart. #8 High value repeat customers who searched for a product on the website but didn’t get any search results. #9 High value repeat customers who watched a product video on the website but didn’t add the product to the shopping cart. #10 High value repeat customers who added a product to the wish list. Similarly you can have remarketing audiences for low value repeat customers. However remarketing audiences for average repeat customers would be slightly different. #1 Repeat customers who abandoned the checkout of a particular high priced product. #2 Repeat customers who abandoned the checkout of a particular low priced product. #3 Repeat customers who abandoned the checkout of a particular product. #4 Repeat customers who abandoned the checkout of a particular high priced product category. #5 Repeat customers who abandoned the checkout of a particular low priced product category. #6 Repeat customers who abandoned the checkout of a particular product category. #7 Repeat customers who started the checkout process but abandon it. #8 Repeat customers who clicked on an internal / external promotion campaign but didn’t make a purchase. #9 Repeat customers who abandoned the checkout because of some website error during the checkout. #10 Repeat customers who searched for a product on the website but didn’t make a purchase. #1 Repeat customers who added a particular high priced product to the shopping cart but didn’t start the checkout process. #2 Repeat customers who added a particular low priced product to the shopping cart but didn’t start the checkout process. #3 Repeat customers who added a particular product to the shopping cart but didn’t start the checkout process. #4 Repeat customers who added any product of a particular high priced product category to the shopping cart but didn’t start the checkout process. #5 Repeat customers who added any product of a particular low priced product category to the shopping cart but didn’t start the checkout process. #6 Repeat customers who added a product of a particular product category to the shopping cart but didn’t start the checkout process. #7 Repeat customers who added a product to the shopping cart but didn’t start the checkout process. #8 Repeat customers who clicked on an internal / external promotion campaign but didn’t start the checkout process. #9 Repeat customers who searched for a product on the website but didn’t start the checkout process. #10 Repeat customers who watched a product video on the website but didn’t start the checkout process. #1 Repeat customers who viewed a particular high priced product but didn’t add it to the shopping cart. #2 Repeat customers who viewed a particular low priced product but didn’t add it to the shopping cart. #3 Repeat customers who viewed a particular product but didn’t add it to the shopping cart. #4 Repeat customers who viewed any product of a particular high priced product category but didn’t add it to the shopping cart. #5 Repeat customers who viewed any product of a particular low priced product category but didn’t add it to the shopping cart. #6 Repeat customers who viewed any product of a particular product category but didn’t add it to the shopping cart. #7 Repeat customers who viewed a product but didn’t add it to the shopping cart. #8 Repeat customers who viewed a particular high priced product category but didn’t click on any product link. #9 Repeat customers who viewed a particular low priced product category but didn’t click on any product link. #10 Repeat customers who viewed a particular product category but didn’t click on any product link. #11 Repeat customers who viewed a product category page but didn’t click on any product link. #12 Repeat customers who viewed an internal /external promotion campaign but didn’t click on it. #13 Repeat customers who searched for a product on the website but didn’t add any product to the shopping cart. #14 Repeat customers who searched for a product on the website but didn’t get any search results. #15 Repeat customers who watched a product video on the website but didn’t add any product to the shopping cart. #16 Repeat customers who added a product to the wish list. #5 Repeat Customers who spent less than the average order value (Low Value Loyal customers). #8 Repeat customers who used the coupon code during the checkout. #9 Repeat customers who always use coupon codes during checkout. #10 Repeat customers who have stopped making purchase from your website. Similarly you can have remarketing audiences for new customers. However remarketing audiences for prospects would be slightly different. #5 Users who started the checkout process but abandon it. #6 Users who abandoned the checkout after entering an invalid coupon code. #7 Users who abandoned the checkout because of some website error during the checkout. #8 Users who searched for a product on the website but didn’t make a purchase. #9 Users who watched a product video on the website but didn’t make a purchase. #10 Users who added a product to the wish list but never purchased it. #5 Users who added items more than the average order value, to the shopping cart but didn’t start the checkout process (high value prospects). #6 Users who added items less than the average order value, to the shopping cart but didn’t start the checkout process (low value prospects). #11 Users who watched a product video on the website but didn’t start the checkout process. #1 Users who viewed a high priced product but didn’t add it to the shopping cart. #2 Users who viewed a high priced product category but didn’t add any product to the shopping cart. #3 Users who viewed a product higher than the average order value but didn’t add it to the shopping cart. #4 Users who viewed a product category higher than the average order value but didn’t add any product to the shopping cart. #5 Users who viewed a product but didn’t add it to the shopping cart. #6 User who viewed a particular high priced product category but didn’t click on any product link. #7 Users who viewed a particular low priced product category but didn’t click on any product link. #8 Users who viewed a particular product category but didn’t click on any product link. #9 Users who viewed a product category page but didn’t click on any product link. #10 Users who clicked on an internal promotion campaign but didn’t add any product to the shopping cart. #11 Users who searched for a product on the website but didn’t get any search results. #12 Users who watched a product video on the website but didn’t add the product to the shopping cart. In the context of non-ecommerce, Remarketing audience is a list of users who abandoned a micro-conversion (like signup, viewing a key page, watching video, listening to podcast etc) on your website. #2 Users who viewed a internal promotion campaign but did not click on it. #3 Users who clicked on a internal promotion campaign but did not complete a micro conversion. #4 User who searched the website but did not complete a micro conversion. #5 User who viewed a campaign video but did not complete a micro conversion. #6 Users who abandoned the lead generation form. #7 Users who saw one of the key pages on your website like ‘contact us’ page, ‘Make donation’ page etc but did not complete micro conversion (like making a phone call). These are low value remarketing audiences as they didn’t show any interest in completing a goal conversion on your website. They are low value because their likelihood of converting is close to zero. Just because someone visit your website once, does not always automatically qualify him/her to become a part of your remarketing audience. You should consider re-targeting these audiences only when you overall website traffic is too low. It is list of users who are most likely to convert in subsequent sessions. This list is managed by Google and is automatically updated (i.e. users are automatically added or removed from the list) on the basis of some machine learning algorithm. Google generates smart list on the basis of the conversion data of your website or similar websites. If your website generates at least 500 orders every month and at least 10,000 page views each day then your smart list is generated on the basis of your website conversion data. Otherwise the smart list is generated on the basis of other similar websites’ conversion data. #2 All users – all visitors (both new and returning visitors) of your website. #3 New Users – users who triggered only one session/visit on your website. # 4 Returning users – users who triggered at least 2 sessions/visits on your website. Other pre-configured audiences are self explanatory. Note: You can create upto 2000 remarketing audiences per GA account. #1 Guide to Dynamic remarketing in Google analytics & Adwords – Learn to implement Dynamic re-marketing campaigns in Google Analytics and Google Adwords. Learn about dynamic attributes and dynamic remarketing audiences. 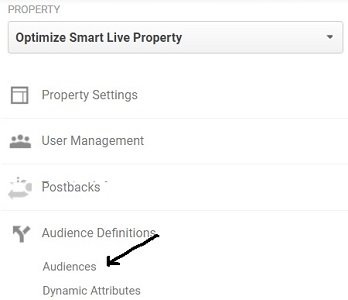 #2 Using Enhanced E-Commerce segments for Remarketing in Google Analytics – Learn to use Enhanced E-Commerce segments for creating Remarketing audience in Google Analytics.